Inspired by Halloween – the scariest, but probably the most creative holiday of them all, we’ve decided to dig through our ketubah gallery and pick an appropriate collection for this day, and of course – gothic ketubah came to mind. When you think of the gothic culture, things that come to mind are darkness, mystery, night, and intense emotions. Just like Halloween, gothic style embraces the dark side and elevates it to a whole new level which is fun, exciting, and unique. It is true that gothic style isn’t for everyone, and cannot be appreciated by people who simply don’t find any elegance in darkness. However, if you’re a fan of the gothic culture, and Halloween happens to be your favorite holiday, we’re quite positive you’ll absolutely love our gothic ketubah collection! Darkness is certainly one of the main symbols of the gothic culture, which has been embodied through music, cinematography, style, clothes, as well as art. Gothic culture is known for its unique representation of darkness since it embraces and celebrates it, instead of emphasizing its negativity – which has been the case in many other cultures. Black color has become the synonym for gothic, since goths appreciate black settings, clothes, accessories, and makeup. People who appreciate the gothic culture and nurture its edgy style have often been perceived as harsh and aggressive, while in reality, their physical appearance was merely a reflection of their inner rebellion against molds they had no intentions of fitting into. What’s particularly interesting when it comes to the development gothic style is that the color of black was combined with none other than pink, which had been avoided and mocked by goths in the past. The addition of the pink color in the exclusively dark gothic style opened the door for the expression of themes of romance and love, which may not have been explored as openly until that historic moment. The Gothchic ketubah is a perfect representation of the addition of elements of love and romance in the gothic culture. 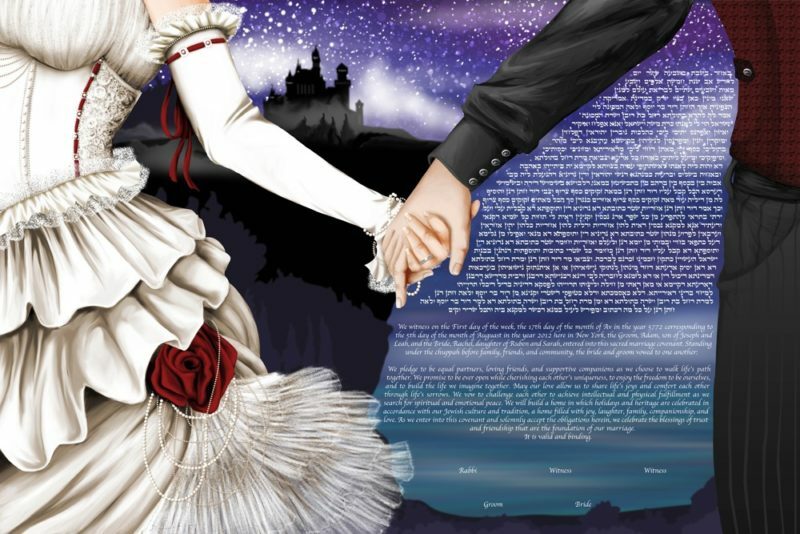 This gothic ketubah design portrays a couple of ancient gothic time, dressed in a corset gown and an elegant suit, holding hands. In the background, we can see more elements contributing to the gorgeously mysterious gothic atmosphere: the darkness of the night (combined with a romantic star-studded night sky), as well as a castle representing the famous gothic architecture. Discover other ketubah designs celebrating the uniqueness and boldness of the gothic culture in our gothic ketubah gallery!